Buying the right bed and mattress is one of the best investments you can make if you consider that you’ll spend much more time (almost one third of your life) on your bed than in your vehicle. Not only are your bed and mattress the most used pieces of furniture in your home, but they will also massively impact the quality of sleep and hence your overall well-being and health. For many people the solution to a good night’s sleep may be right underneath them, and yet, there are very few guides on how to assist people to select the right mattress and bed. This guide aims to address that need. Regardless of the styling and decor of your bedroom, remember to follow these four criteria when buying a mattress: size, durability, comfort and support. Your bed should firstly be small enough to fit into your bedroom and leave enough space to move around the bed freely. Your mattress should be large enough for you to fit comfortably without any of your body hanging off or resting on the outer bed edges. You should have enough space for some movement during sleep. If you share a bed, the same rules apply. There should be enough room for both of you. Mattress comfort has to do with how the mattress adapts to your body and how your bed “wraps its gentle arms” around your body. Mattress comfort is influenced by fabric quality and fabric type. A mattress’ layers of cushioning materials and padding (in the case of innerspring mattresses) make all the difference. 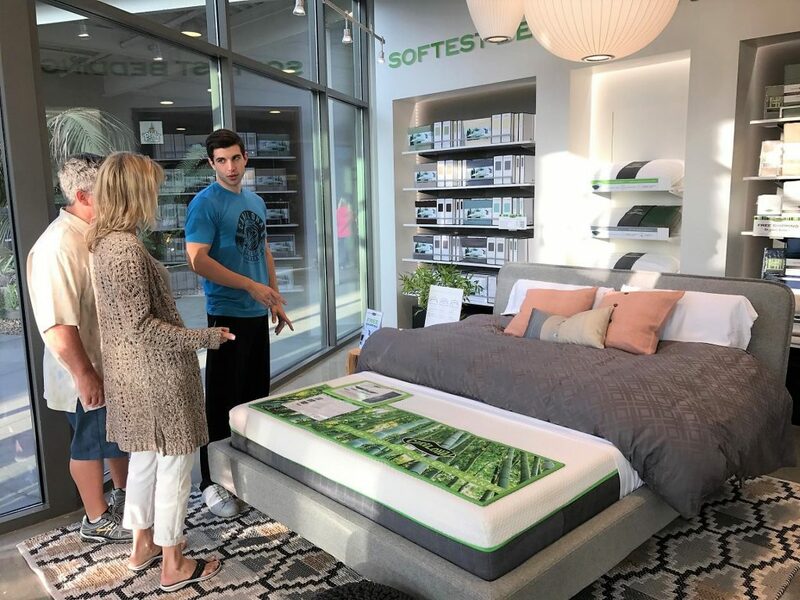 Each mattress uses different raw materials, different thicknesses, and different exterior and interior fabrics and materials – each having various qualities and properties. Some mattresses, like the Cariloha Bamboo Mattress, naturally wick away moisture, repel odors, and sleep cooler and comfier thanks to their bamboo properties, while others feature pocketed coils or various layers of memory foam to get the right fit. Look at the features and benefits of both and feel what works best for your body and your sleep preferences. A good mattress and bed should support your body in all the right pressure and contour points, keeping your spine in its natural, healthy position for better posture. The heaviest parts of your body are the most important areas to support – your shoulders, hips and lower back. Your spine’s position during sleeping is essential to maintaining the health of your spine. The spine curves naturally forward in the neck, backwards in the back and forwards again in the lower back. The spine, in its natural position, reduces the pressure on nerves, the muscles and spinal discs and allows for a restful, rejuvenating sleep. The quality of the bed materials and bed fabrics and the manufacturing quality standards determine the life of a mattress, while the structural elements (springs and frame) influence the comfort and support. Buying a bed, a mattress or a headboard is a personal choice. While the guidelines above are aimed at assisting you in making the right choice of bed or mattress, it remains a personal choice and this decision is influenced by many other factors. Other reasons will most certainly influence your mattress choice, such as body type (weight, height), price, branding, user-friendliness, thickness, etc. Your age, your sleeping habits, and your sleeping position, your pillows and headboard are also contributing factors. Buying a bed and a mattress is one of the biggest investments you will make! Remember that choosing the right mattress for your needs is one of your most important decisions because it will influence your body’s ability to rejuvenate itself, your effectiveness and health. A good mattress should support your body while you sleep and should allow you to move during your sleep without affecting your partner. It needs to offer the right firmness and thickness for your body type. The best mattress will offer functionality both when you’re lying down and when you’re sitting up in bed.